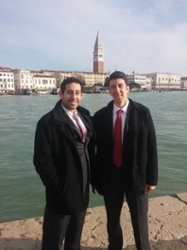 Tobias Tatum (JD 2016) won Best Oralist in an international moot competition in Venice, Italy held March 9 – 11. Ashley Barnett (JD 2016) was team captain and Anton Sorkin (LLM 2016) was brief writer. Dr. Mark Goldfeder was coach. The team advanced to the finals after submitting briefs last semester. The problem regarded prayer in public school. The Law School at University of Notre Dame won the competition. The 2016 Law and Religion Moot Court Competition was sponsored by the Fondazione Marcianum.